I mentioned that I received an Accordance module of codices from the Massengills and Cerones for my birthday. Well, yesterday I was finally able to sit down and dabble. To my delight I found a phenomenon of which all students of textual criticism are made aware early in their careers. 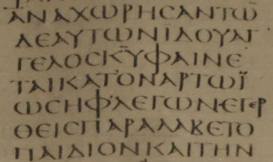 The nomina sacra “sacred name.” When the word κυριος “Lord” is used with reference to the divine, it is abbreviated as ΚΥ with a macron spanning the two letters. You too can see this phenomenon in Codex Sinaiticus in this image. Train your eye on the third line in the middle of the text: ΓΕΛΟCΚΥΦΑΙΝΕ. I know that this is not a new find and may be very mundane for many, but to be given the opportunity to look at an ancient manuscript and see with my own eyes this scribal practice was nothing less than exhilarating. Now if that was exhilarating, imagine what I felt when I found this as I was reading through Matt 2:6: ΙΗΛ. You can see this at the very bottom right of the image. It is the last three letters of the excerpt. I’ve never learned the Greek word “Iel.” That’s because this is an abbreviation for ΙCΡΑΗΛ, Ισραηλ, or Israel. No, this is not a significant find, but I was never told to expect any abbreviations in the ancient texts other than the nomina sacra. 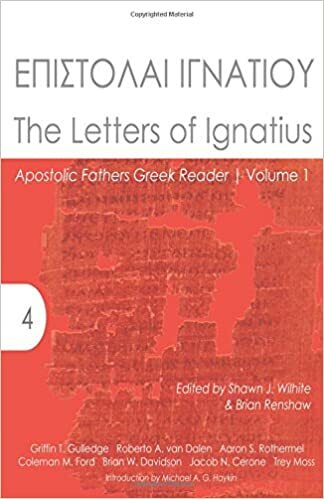 An aside for the attentive observer… Sinaiticus is an Uncial text. Uncial texts are characterized by continuous writing (no breaks in the text to differentiate where one word ends and another begins), no punctuation, and most importantly all letters are capitalized. These features make for a very slow and interesting read. 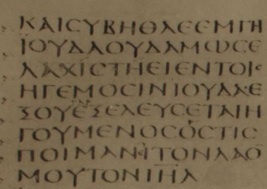 This entry was posted in NT Codices and tagged Sinaiticus. Bookmark the permalink. You are a super (awesome) nerd. I wouldn’t have it any other way.